What is carbide milling cutters? HomeAll Posts...What is carbide milling cutters? Carbide milling cutters are milling cutters made of cemented carbide. To understand the cemented carbide milling cutter, we must first know what is a hard alloy. The cemented carbide is based on the carbide (WC, TiC) micron powder of high hardness refractory metal, with cobalt (Co) or nickel (Ni). Molybdenum (Mo) is a binder and is a powder metallurgy product sintered in a vacuum furnace or a hydrogen reduction furnace. Carbide milling cutters are generally used in CNC machining centers and cnc engraving machines. It can also be loaded onto a conventional milling machine to process some hard and uncomplicated heat treatment materials. 1. Carbide cylindrical milling cutter: used for horizontal milling machine processing plane. The teeth are distributed on the circumference of the milling cutter and are divided into straight teeth and spiral teeth according to the tooth shape. According to the number of teeth, there are two kinds of coarse teeth and fine teeth. The spiral tooth coarse-tooth milling cutter has a small number of teeth, high tooth strength and large chip space, which is suitable for rough machining; the fine-tooth milling cutter is suitable for finishing. 2. Carbide face milling cutter: It is used for vertical milling machine, end milling machine or gantry milling machine. It has cutter teeth on the end face and circumference, and also has coarse teeth and fine teeth. The structure has three types: integral type, insert type and indexable type. 3. 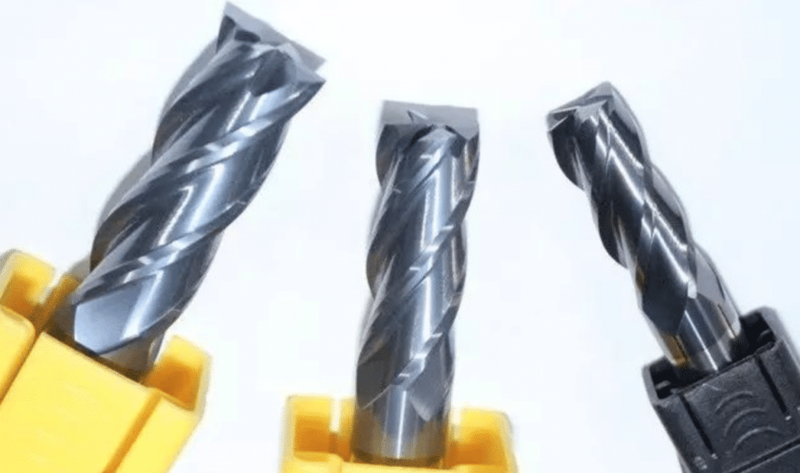 Carbide end mill: used to machine grooves and step surfaces, etc., the teeth are on the circumference and end faces, and can not be fed in the axial direction during operation. When the end mill has a tooth that passes through the center, it can be fed axially. 4. Carbide three-face milling cutter: used to machine a variety of grooves and step surfaces, with teeth on both sides and circumference. 5. Carbide angle milling cutter: used to mill a groove at a certain angle, there are two kinds of single angle and double angle milling cutter. 6. Carbide saw blade milling cutter: used to machine deep grooves and cut workpieces, with more teeth on the circumference. In order to reduce the friction during milling, there are 15’~1° secondary declinations on both sides of the cutter. In addition, there are keyway milling cutters, dovetail milling cutters, T-slot milling cutters and various forming cutters. The first is down-cutting. The direction of rotation of the milling cutter is the same as the direction of feed of the cutting. At the beginning of the cutting, the milling cutter bites the workpiece and cuts the last chip. The second type is up-cut milling. The direction of rotation of the milling cutter is opposite to the direction of feed of the cutting. The milling cutter must slide over the workpiece before starting the cutting. The cutting thickness starts at zero and the cutting thickness reaches the end of the cutting. maximum. When milling, the cutting force presses the workpiece against the table, and the cutting force causes the workpiece to leave the table during up-cut milling. Since the cutting effect of the down-milling is the best, the down-cutting is usually preferred. Only when the machine has a thread gap problem or if there is a problem that can not be solved by the down-milling, the up-cutting is considered. Each time a cemented carbide milling insert enters the cutting, the cutting edge is subjected to an impact load, which depends on the cross-section of the chip, the material of the workpiece and the type of cutting. Ideally, the diameter of the milling cutter should be larger than the width of the workpiece. The centerline of the milling cutter should always be slightly separated from the centerline of the workpiece. When the tool is placed against the center of the cutting, burrs are easily generated. The direction of the radial cutting force will change continuously as the cutting edge enters and exits the cutting. The machine tool spindle may vibrate and be damaged. The blade may be broken and the machined surface will be rough. The carbide milling cutter will be slightly off center and the cutting force direction will be No longer fluctuating, the cutter will get a preload. 1. Check the power and stiffness of the machine to ensure that the required cutter diameter can be used on the machine. 2. The overhang of the tool on the spindle is as short as possible, reducing the influence of the axis of the milling cutter and the position of the workpiece on the impact load. 3. Use the correct milling pitch suitable for this process to ensure that there are not too many blades to engage the workpiece at the same time to cause vibration during cutting. On the other hand, ensure that there are enough blades when milling narrow workpieces or milling cavities. Engages with the workpiece. 4. Make sure that the feed per blade is used to achieve the correct cutting results when the chips are thick enough to reduce tool wear. The indexable insert with positive rake groove shape provides smooth cutting results and lowest power. 5. Use a milling cutter diameter that is appropriate for the width of the workpiece. 6. Use the correct lead angle. 8. Use cutting fluid only when necessary. 9. Follow tool maintenance and repair rules and monitor tool wear. Proper maintenance of carbide milling cutters can extend tool life and increase work efficiency. Milling stainless steel except end mills and some end mills and carbide as milling cutter materials, all other types of milling cutters are made of high-speed steel, especially tungsten-molybdenum and high vanadium high-speed steel have good effect, the tool Durability can be 1 to 2 times higher than W18Cr4V. Carbide grades suitable for making stainless steel milling cutters are YG8, YW2, 813, 798, YS2T, YS30, YS25 and the like. The effect of spray cooling is the most significant, which can increase the durability of the milling cutter by more than one time; if it is cooled by a general 10% emulsion, the cutting fluid flow should be sufficiently cooled. When milling carbide with carbide milling cutter, take Vc=70～150m/min, Vf=37.5～150mm/min, and adjust it according to the alloy grade and workpiece material. The adhesion and fusion of stainless steel are strong, and the chips are easy to adhere to the cutting edge of the milling cutter, which deteriorates the cutting conditions. When the milling is performed, the cutting edge first slides on the hardened surface, which increases the tendency of work hardening; impact during milling The vibration is large, which makes the milling cutter blade easy to chip and wear. When milling stainless steel, the cutting edge must be sharp and bear the impact, and the chip pocket should be large. Large helical angle milling cutters (cylindrical milling cutters, end mills) can be used. The screw angle b is increased from 20° to 45° (gn=5°), and the tool durability can be increased by more than 2 times because the milling cutter works at this time. The rake angle g0e increases from 11° to over 27°, and the milling is light. However, the b value should not be large, especially the end mill should be b ≤ 35 °, so as not to weaken the teeth. The stainless steel pipe or thin-walled parts are processed by the wave edge end mill, the cutting is light, the vibration is small, the chips are brittle, and the workpiece is not deformed. High-speed milling with carbide end mills and milling of stainless steel with indexable end mills have achieved good results. Milling 1Cr18Ni9Ti with silver end mills with geometric parameters gf=5°, gp=15°, af=15°, ap=5°, kr=55°, k′r=35°, g01=-30° , bg=0.4mm, re=6mm, when Vc=50～90m/min, Vf=630～750mm/min, a′p=2～6mm and the feed amount per tooth reaches 0.4～0.8mm, the milling force is reduced. Smaller 10% to 15%, milling power is reduced by 44%, and efficiency is greatly improved. The principle is that the negative chamfer is ground on the main cutting edge, and the built-up edge is artificially generated during milling, so that it can be cut instead of the cutting edge. The front angle gb of the built-up edge can reach 20~~302, due to the lead angle The effect is that the built-up edge is caused by the thrust generated on the rake face parallel to the cutting edge to become the auxiliary chip, thereby taking away the cutting heat and lowering the cutting temperature. When milling stainless steel, it should be processed by the same method as possible. 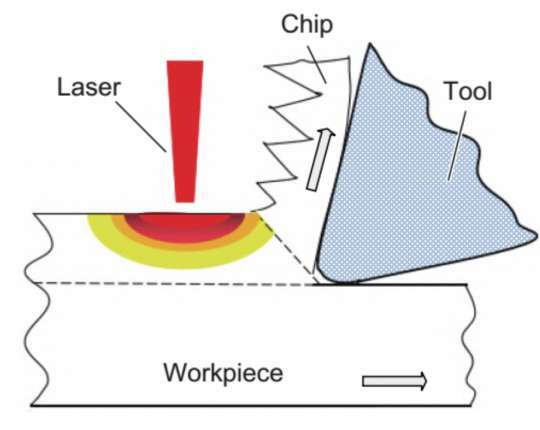 The asymmetrical cross-milling method can ensure that the cutting edge is smoothly cut off from the metal, and the contact area of ​​the chip bonding is small, and it is easy to be smashed under the action of high-speed centrifugal force, so that the chip impacts the rake face when the tooth re-cuts into the workpiece. Peeling and chipping improve the durability of the tool. Stainless steel materials are widely used and can be encountered in machining, milling, drilling and tapping. But because stainless steel has different characteristics than other general materials, processing stainless steel has become a big problem for technicians!